Filson Oil Finish Wax. $10.00. Filson is Filson, and it's exactly as advertised. Gun Dog Supply was prompt in getting it to me at a good price. No complaints here. Filson, enough said! Gun dog supply was great as usual! Filson makes tough products. They remain tough if taken care of. That's where the wax comes in. Good stuff. 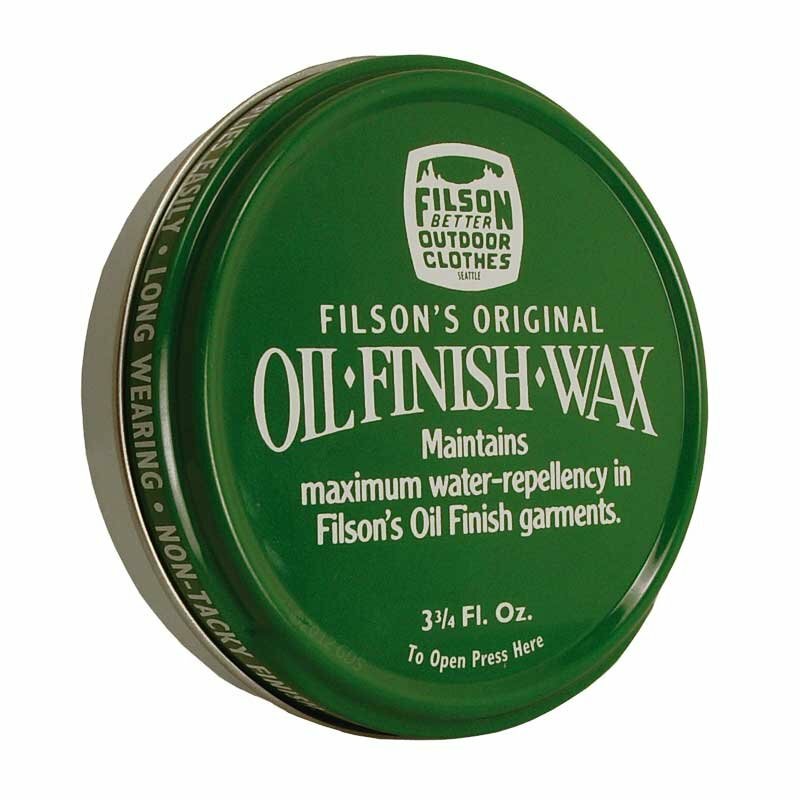 Touch up hard wearing or flex areas on oil finish Filson garments. For touching up hard wearing or flex areas on oil finish Filson garments, or for complete reproofing. The special paraffin-based wax gives your Filson garment extreme durability and resistance to wind and water, while remaining pliable for extended comfortable wear. Heavy-use areas can benefit from occasional touch-ups. Under extremely heavy use, areas of the garment subject to abrasion and flexing can lose some of their finish, and therefore some of their water repellency. By giving those areas a little extra protection from time to time with Filson's Original Oil Finish Wax, you can maintain water repellency as good as the day you bought the garment. Re-proof as often as necessary. Contains 3 3/4 fl. oz. Made in the USA. For best results re-proof in warm conditions. If in sub-freezing temperatures, it my be necessary to place metal wax tin in hot water to soften wax. Brush all excess dirt from the area to be treated. Wipe clean with a soft cloth and cold water. WARNING: Use clean cold water ONLY. Do NOT use soap or detergents. Apply wax generously with your fingers or a clean cloth. Use light, short, circular strokes to work thoroughly into the affected areas -- usually seams, creases, and high-flex areas. Use a hair dryer or heat gun evenly over application, or hang in direct sunlight, for a real "factory" finish. Hang garment overnight in a warm place, away from open flame.